TrueBlack® Lipofuscin Autofluorescence Quencher, 20X in DMF, is a new reagent for quenching lipofuscin autofluorescence in tissue sections for immunofluorescence staining. Lipofuscin consists of highly autofluorescent granules of oxidized proteins and lipids that build up in the lysosomes of aging cells. 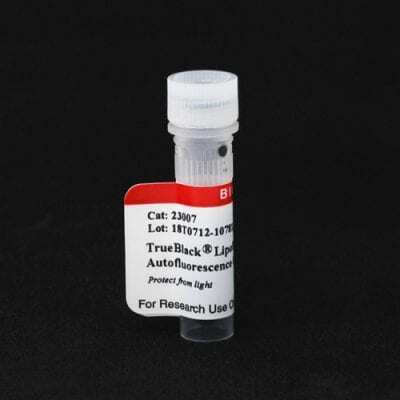 Lipofuscin granules fluoresce brightly in all channels used for fluorescence microscopy, and accumulate in a variety of cell and tissue types with age. Consequently, imaging of specific immunofluorescence signal in certain adult human tissues or aged animal tissues can be virtually impossible unless methods are employed to quench or mask lipofuscin fluorescence. Traditionally, Sudan Black B has been used to quench lipofuscin autofluorescence by incubating tissue sections with the dye after immunofluorescence staining. However, while it masks the autofluorescence from lipofuscin, Sudan Black B also introduces uniform non-specific background fluorescence in the red and far-red channels (Fig. 1), limiting the use of fluorescent dyes in those wavelengths. Now Biotium has developed TrueBlack® as a superior alternative to Sudan Black B. TrueBlack® quenches lipofuscin fluorescence with far less increase in red/far-red background fluorescence (Fig. 1). TrueBlack® treatment can be performed before or after immunostaining. It is rapid, simple, and has minimal effect on signal from fluorescent antibodies or nuclear counterstains, thus preserving the signal-to-noise ratio of the immunostaining (Figs. 2-3). TrueBlack® effectively eliminates lipofuscin autofluorescence in tissues like human and mouse brain and retina (see Figs. 1-3 and TrueBlack® References). TrueBlack® also can reduce autofluorescence from other sources, such as collagen, elastin, red blood cells, and general background fluorescence. It is not as effective at quenching these sources of autofluorescence as it is for lipofuscin, but it can improve background in human and non-human tissue types (Figs. 4-5). TrueBlack® also has been used to quench background fluorescence on polycarbonate filters used as cell supports for imaging cytometry. TrueBlack® Lipofuscin Autofluorescence Quencher belongs to our TrueBlack® line of background reducing agents for fluorescence applications, which includes TrueBlack® WB Blocking Buffer Kit for western blotting, and TrueBlack® Background Suppressor System (Permeabilizing) for blocking non-specific immunofluorescence staining. Also see our other accessory products for immunofluorescence staining and other applications. Figure 1. Lipofuscin autofluorescence in methanol-fixed adult human brain sections. In untreated tissue (top row), lipofuscin appeared as fluorescent granules that fluoresced in all fluorescence channels. Sudan Black B (middle row) masked lipofuscin autofluorescence, but introduced background in the red and far-red channels. TrueBlack® (bottom row) masked lipofuscin with minimal increase in fluorescence background (bottom row). Methanol-fixed cryosections of adult human cerebral cortex were left untreated or stained with 0.1% Sudan Black B in 70% ethanol or 1X TrueBlack® according to product protocol. Samples were imaged at the same gain settings on a Zeiss LSM 700 confocal microscope in the FITC (green), Cy®3 (red), and Cy®5 (far-red) channels. Figure 2. Quenching of lipofuscin autofluorescence using TrueBlack® pretreatment before immunofluorescence staining. Formaldehyde-fixed human cortex cryosections were left untreated (A) or treated with TrueBlack® (B), then stained with CF®488A anti-NeuN antibody conjugate (green) and DAPI (blue). Sections were imaged in all channels on a Zeiss LSM700 confocal microscope. A. Lipofuscin fluoresces brightly in all channels, appearing as white spots (red arrows) in the merged image of untreated tissue. B. TrueBlack® pretreatment eliminated lipofuscin autofluorescence, with negligible effect on specific staining. Figure 3. Quenching of lipofuscin autofluorescence using TrueBlack® post-treatment after immunofluorescence staining. Methanol-fixed cryosections of human cerebral cortex were stained with rabbit anti-GFAP followed by CF®640R goat anti-rabbit (cat. no. 20176) and DAPI (cat. no. 40009). Sections were left untreated or treated with TrueBlack®, then mounted in EverBrite mounting medium (cat. no. 23001). Untreated sections (left) showed lipofuscin autofluorescence (white arrows) in addition to GFAP immunofluorescence (glial processes, magenta) and DAPI staining (nuclei, blue). TrueBlack® (right) eliminated lipofuscin fluorescence while maintaining good signal-to-noise for GFAP immunostaining in the far-red channel (magenta) and nuclear counterstaining (blue). Figure 4. TrueBlack® reduces non-lipofuscin autofluorescence in human kidney sections in the FITC, Cy®3, and Cy®5 channels. Human kidney cryosections were fixed in ice-cold methanol and nuclei were stained with DAPI (blue). Autofluorescence was imaged on a Zeiss LSM 700 confocal microscope in all channels with the same imaging settings for both samples.Top panel: untreated; Bottom panel: TrueBlack®-treated. Figure 5. TrueBlack® reduces non-lipofuscin autofluorescence in the FITC channel in rat kidney tissue sections. Rat kidney cryosections were fixed in formaldehyde, and left untreated (A) or treated with TrueBlack® (B). Nuclei were stained with DAPI (blue). Autofluorescence in the FITC channel (green) was imaged on a Zeiss LSM700 confocal microscope using the same imaging settings for each sample. A revolutionary antifade mounting medium optimally formulated for preserving fluorescence of our CF® dyes and other fluorochromes. EverBrite™ Hardset mounting medium hardens at room temperature completely in 24 hours. The SuperHT PAP Pen draws a water repellent circle around slide mounted tissue and prevents the waste of valuable reagents by keeping the liquid pooled in a single droplet. Available in two sizes, regular (4 mm tip) and mini (2.5 mm tip).